Sega admits that the upcoming Sonic Colors is being developed specifically for kids and not "core" gamers. If you would consider yourself a core gamer, Sega is telling you to stop looking forward to Sonic Colors right now. Why? Because it's being made specifically for kids over six and under twelve. The rest of you should anticipate Sonic 4 instead. In a candid interview with CVG, Sonic Colors lead designer Takashi Iizuka reiterated that the game is for young children and only young children. He said: "We know there are sometimes opinions about control from core gamers, but we're intending Sonic Colors to be played by children of probably between six and twelve years-old." 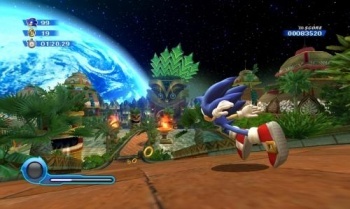 "With Sonic Colors we have aimed to make a game that everyone can control and have fun in. So, it's not really a game for the core gamers." Sonic Colors is meant to give children a Sonic game that they can easily get through without too much trouble. He divides the Sonic audience between those that are somewhat older fans of the Genesis versions of Sonic the Hedgehog, and those that are younger and have played mostly the 3D versions of Sonic such as Sonic Unleashed and Sonic and the Black Knight. These games weren't received well by that older audience, but apparently this was somewhat intentional. Now, with the creation of both Sonic Colors and Sonic 4, Iizuka believes the "needs of both of the two core groups of Sonic fans are being addressed." This appears to indicate a split in Sonic development at Sega between an older and younger audience. The good part about this is that Sega at least acknowledges that people want more of the Sonic games from the past, but the company still needs to rake in as much cash as it can from younger kids that might need something easier-to-play. And there's nothing stopping those same young kids from picking up Sonic 4, as I'm sure they will. This is fine, just as long as Sega realizes that there's a difference between "easy to play" and "terrible."